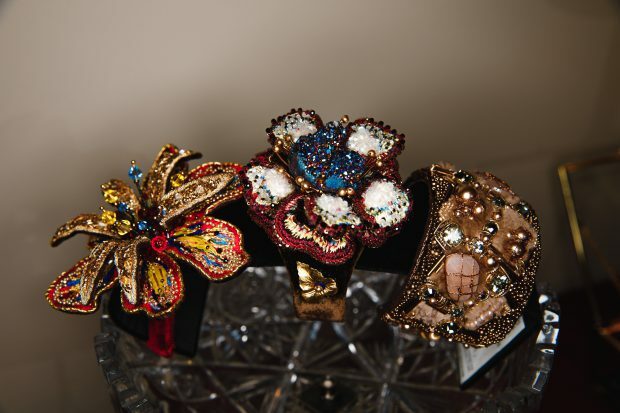 Konstantin Gallery recently had the pleasure of hosting the inimitable Larisa Shamuradova (the artist known as Lorushka), and her exclusive collection of fine designer jewelry. 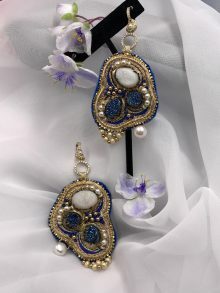 All handmade by the artist herself, the pieces exhibited were breathtaking compositions of natural stones, freshwater pearls, Swarovski crystals, Shibori silk, and 24k Japanese gold-plated beads. 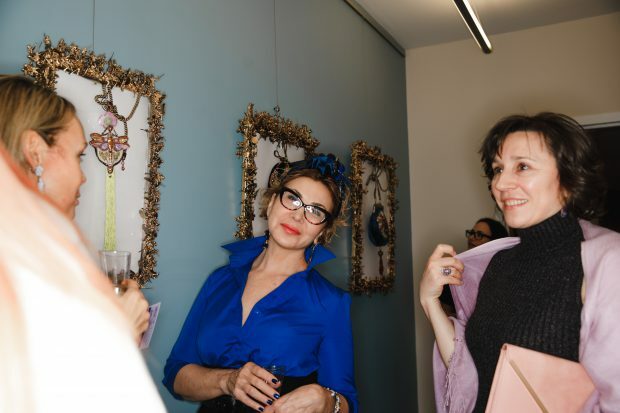 The work was supported by not only the Konstantin Gallery and its patrons but also Lorushka’s collaborators at Sova City Design Gallery who provided the magnificently handcrafted frames for each piece. 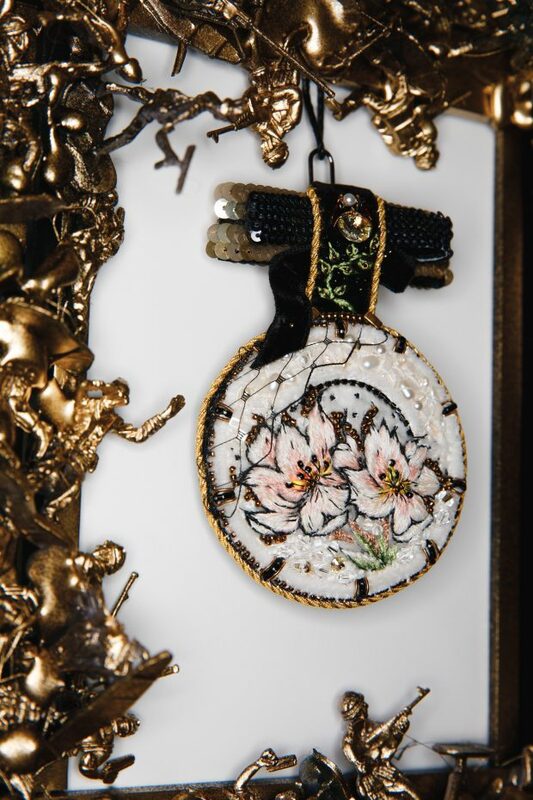 The jewelry alone is no less than captivating but with the added allure of the frames, Lorushka’s work is elevated to an absolutely stunning experience that we’re honored to have on display here at Konstantin Gallery, and anyone would be lucky to have at home in their private collection. The evening began with light refreshments, wine and hors d’oeuvres for our guests, some of whom arrived as early as 5:30 despite the 6pm opening. 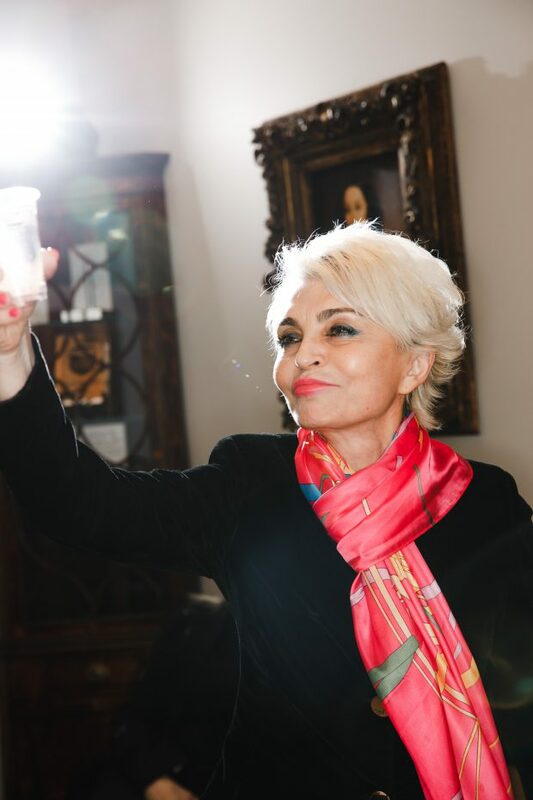 Their enthusiasm is both appreciated and understood, however, because the exhibit was scored by none other than our very own Lyudmila Fesenko and Sergei Pobedinsky, two accomplished performers who serenaded us with renditions of light opera and popular music both Russian and global. Their talent is truly a gift that we were fortunate to experience in such an intimate and curated space. After introducing Lorushka, Lyudmila, and Sergei, Dr. Konstantin went on to introduce the evening’s special guest, highly esteemed prosthodontist Dr. Nargiz Schmidt, DDS. It was very clear at this point that we were all in a room surrounded by some of the greatest minds and artists that New York City has to offer. Granted, this city is not one with a deficit in regards to talent and professionalism, but the assemblage of such people in such a concentrated space was a reminder for us all, and an experience we will cherish indefinitely – or at least until the next Konstantin Gallery exhibition. The remainder of the evening consisted of myriad, sundry conversations around art, science, and their convergence. Accompanied by live performance and masterful visual art, guests were able to inquire about cosmetic practices and ask any questions they may have had about the facial rejuvenation services provided here at Dr. Konstantin’s New York office. We were more than happy to answer as many questions as we had time for of course, and were even able to schedule consultations with guests who were ready to move forward in their quests to restore their natural beauty. 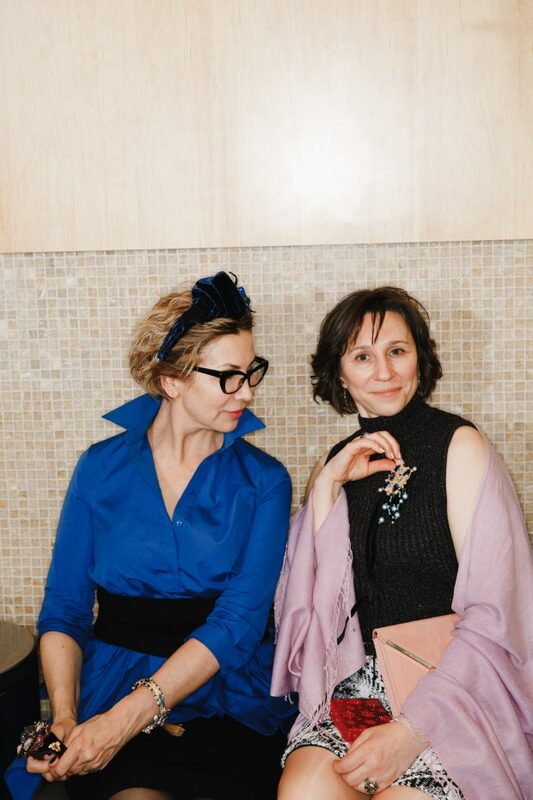 Much to everyone’s delight, we were also joined by a representative of Allergen, who ensured that every guest receive both a $50 Off promotional gift card for Botox, and a $200 Off gift card for syringes of Juvederm Voluma. To say it was a joyous occasion would be an understatement. The evening was enchanted, the artwork and the performances were divine, and the guests who made it worth hosting were equally as commendable. We look forward to the next Konstantin Gallery show with great anticipation, and we hope you can join us when the time comes. The exhibition will remain open and artwork will be available for purchase throughout the month of February. Visit Konstantin Gallery today and take home a Valentine’s Day Gift that makes a statement, or just come in and ask about receiving your own consultation while promotions last. Dr. Konstantin is a double board-certified facial plastic surgeon specializing in artful treatment of the aging face, eyelids, and neck. He performs more than 1,000 facial cosmetic procedures annually, making him one of the busiest facial plastic surgeons in Manhattan. Copyright © 2019 Dr. Konstantin Vasyukevich. All rights reserved. Dr. Konstantin Vasyukevich is a board-certified facial plastic surgeon specializing in cosmetic and reconstructive facial plastic surgery for patients throughout New York City, Manhattan, and Brooklyn. His expertise includes facelifts, brow lifts, blepharoplasty (eyelid surgery), rhinoplasty, and cosmetic injectables including BOTOX® Cosmetic and fillers.